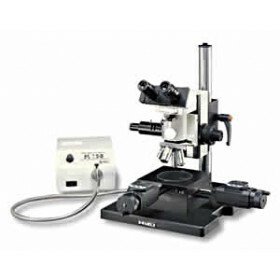 Metallurgical reflective light compound binocular microscope system with 50x to 500x zoom magnification, 4 Infinity-Corrected Plan Epi Objectives (5x, 10x, 20x, 50x), pillar base, reflected light stage and fiber-optic Koehler halogen illuminator. 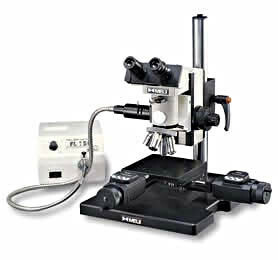 The Meiji MC40 binocular measuring microscope offers Infinity-Corrected Plan Epi optics with 150W Koehler illumination. They are ideal for operators performing visual inspections in applications requiring accurate measurement of small components. Digital readouts with the optional Mitutoyo Digital X-Y Micrometers can be set to English or Metric units to meet any documentation requirements. Four Infinity-Corrected Plan Epi objectives are included (M5X, M10X, M20X, and M40X). The objectives rotate smoothly on a ball bearing-mounted, quadruple nosepiece. The widefield HWF10X eyepiece and HWF10X-F focusing eyepiece enable magnification settings of 50x, 100x, 200x, and 400x. Full vertical Koehler illumination is standard, powered by a 21V 150W halogen lamp (available as either 110/120V or 220/230V). 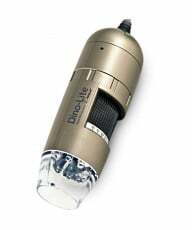 The lamp includes a sliding rotatable polarizer and a filter set that includes blue clear, green clear, neutral density (ND8), and polarizing filters in metal mounts. There is a port that accepts a flexible, 914mm (36 in.) single-arm fiber-optic light guide (included). The heavy-duty laminate base includes a machined, 38mm diameter pillar and mounting bracket. The base plate measures 300 x 300 x 25mm for excellent stability and is finished with protective black paint to withstand industrial environments. It supports a 150 x 150mm reflected light stage with 50mm X-Y precision movement and integrated brackets for mounting optional Mitutoyo digital X-Y stage micrometers. Note: The MC40 above is shown with Mitutoyo Digital X-Y Stage Micrometers, sold separately. Metallurgical reflective light trinocular microscope system with 50x to 500x zoom magnification, 4 Infinity-Corrected Plan Epi Objectives (5x, 10x, 20x, 50x), pillar base, reflected light stage and fiber-optic Koehler halogen illuminator. 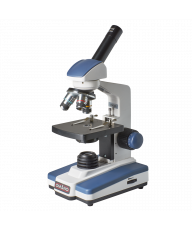 The Meiji MC50 trinocular measuring microscope offers Infinity-Corrected Plan Epi optics with 150W Koehler illumination. They are ideal for operators performing visual inspections in applications requiring accurate measurement of small components. 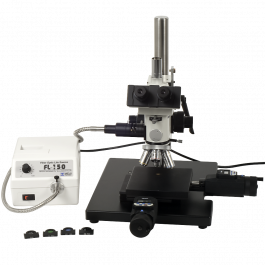 Digital readouts with the optional Mitutoyo Digital X-Y Micrometers can be set to English or Metric units to meet any documentation requirements. 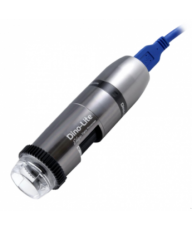 For digital imagery work, an optional trinocular head features a sliding beam splitter which directs 100% of the light to the eyepieces or 80% to the trinocular port and 20% to the right eyepiece. The integrated top-mounted camera port and available adapters allow image capture from conventional 35mm, CCD and CMOS digital cameras. 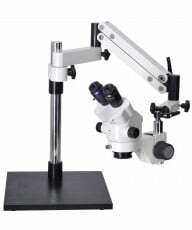 Note: The MC50 above is shown with Mitutoyo Digital X-Y Stage Micrometers, sold separately. Designed for precision measurement duties, the MC40/50 series can be used for a wide range of metallurgical applications requiring exacting measurement documentation. They include Meiji's excellent infinity corrected optical system with four Planachromat Epi objectives, 5x, 10x, 20x and 50x and two SWH 10x eyepieces. Koehler 150W fiber optic vertical halogen illumination is included. Lifetime Limited Warranty. 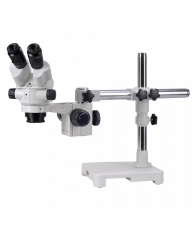 The Siedentopf head, inclined at 30°, is available in binocular or trinocular format and includes a depolarizer. Interpupilliary adjustment is 53mm to 75mm and there is a diopter on the left eyetube for individual eye focusing. 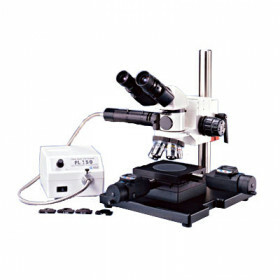 Eyepieces include two HWF10x widefield high eyepoint eyepieces, FN 18, one of which includes a cross-line reticle and pointer. Four Infinity-Corrected Plan Epi objectives are included (M5X, M10X, M20X, and M50X). The objectives rotate smoothly on a ball bearing-mounted, quadruple nosepiece. The widefield HWF10X eyepiece and HWF10X-F focusing eyepiece enable magnification settings of 50x, 100x, 200x, and 500x.